In 1979, something happened in comics that would change everything — Marvel made its first sales of distinct direct edition comic books to specialty comic shops, at discounted prices but on a non-returnable basis. That was a major development, because outside of some non-returnable comics produced for Whitman/Western Publishing starting in 1977, the prior primary distribution method for comic books was the newsstand model: unsold copies could simply be returned for a refund. Returned for a refund? That’s exactly right… Historically, the unsold comics themselves were literally shipped back. How inefficient is that!? The shipping cost alone cut deeply into profits, not to mention the cost of manufacturing more comics than actually sold through (not knowing how many would sell, and not wanting to under-produce, it was common on average to publish three comics for every one that ultimately sold). Then at some point they figured out they could save on the return shipping cost by permitting just a torn off cover as evidence of an unsold copy. While this was an improvement over shipping back entire comics, there was still the large administrative cost to manage this process and issue credits for returns. As comic shops started to grow in popularity, the idea came about to sell copies of comic books directly to the shops on a non-returnable basis. Not only would this eliminate the administrative costs to accept returns, but Marvel could publish a more precise number of copies instead of over-producing each issue. These savings would enable Marvel to offer the shops a hefty discount to cover price, in exchange for the guaranteed sale. And it worked, but there was an initial hiccup: at first, there was nothing to distinguish a direct-sold copy, from a returnable newsstand copy. And some shops were buying with their discount at what was supposed to be a non-returnable basis, but since the copies could not be told apart they were returning them through the newsstand channel and pocketing the spread. Clearly, this could not continue; there needed to be two distinct print run batches, so that direct sold copies could be told apart from returnable newsstand copies. The first attempt to close the loophole and make direct sold copies distinguishable: a strike-through of the bar code. This served the purpose, but didn’t look so great. 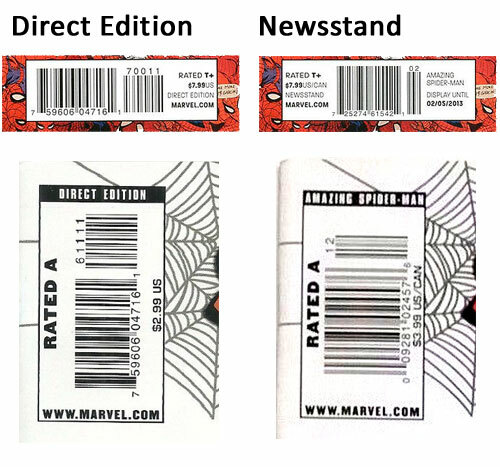 And that’s the origin of the Spider-Man Rectangle that appears in place of the bar code, on direct edition copies. 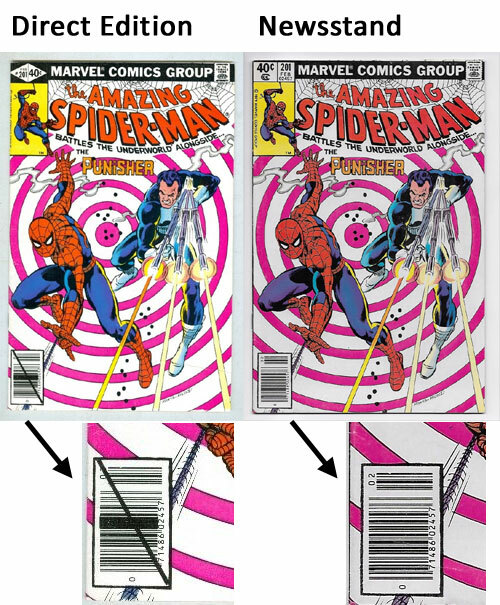 It amazes me to this day how many collectors don’t know — nor even think about — why some copies of comics have the bar code and some have the Spider-Man Rectangle (or some variation of it). But that’s the “origin story” of that rectangle… it appeared in connection with closing the loophole to keep non-returnable comics distinguishable from returnable comics. 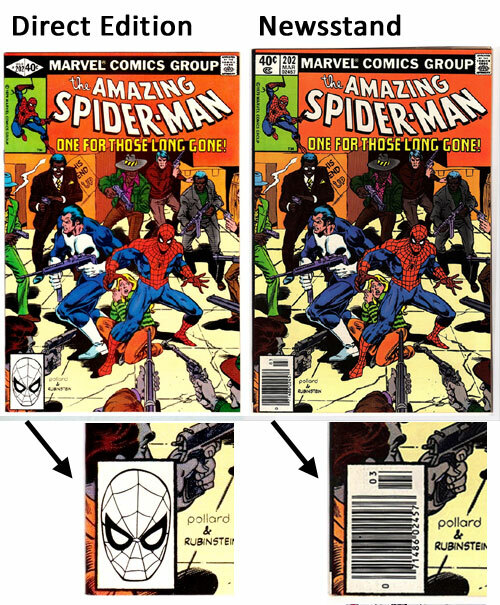 Comics with the Spider-Man rectangle were direct sold to comic shops on a discounted but non-returnable basis, while over on the newsstands, unsold copies with UPC codes could be returned through the traditional newsstand channel. In these more modern examples, the direct edition and newsstand copies both were given UPC codes, but if you look closely you’ll see they are actually different, once again distinguishing the non-returnable direct sold copies (which have “Direct Edition” on their bar code boxes). Some even had different price tags: in the bottom example, the Direct Edition copy has a cover price of $2.99, while the Newsstand Edition copy has a cover price of $3.99. Although these are estimates (also see: Newsstand Rarity Discussion & Estimates), what this chart above clearly shows, is that what began as a good idea — to start making non-returnable direct edition sales to comic shops in 1979 — absolutely exploded into Marvel’s primary distribution method. That first year, just ~6% of their total distribution was direct sales to comic shops (and said to be over 10% for more popular titles like X-Men), but by the 1985/1986 time-frame it was an even 50/50 split. Talk about a successful idea! By the 1990’s newsstand sales had dwindled to a mere ~15% of the total. That’s absolutely remarkable. Remember when I posed the question: if the number of copies sold of each type were different, then would it make a difference to you? Suppose you are looking to collect a comic book published in the 1990’s. Given this estimated data of an approximate 85/15 direct/newsstand split, would you rather have a Near-Mint (NM) copy from the direct edition print run, or an NM copy from the newsstand edition print run? Before you answer that question, keep in mind that in contrast to comic shops which were careful to keep their copies in pristine condition, newsstands had no staff training to protect condition and the comics were treated like magazines or other competing publications, with the notion that the buyer didn’t care about condition — they just wanted to read the thing. And that’s true: newsstand purchasers did want to read the comics they bought. Those newsstand buyers tended to be readers. A collector buying from the newsstand was the exception, not the norm. So a NM copy from the newsstand print run, logic would dictate, would be the exception, not the norm of typical condition. So not only do you have a distribution disparity tilted dramatically in the direction of direct-edition prevalence and newsstand rarity, you also have a condition disparity (surviving direct edition copies tending to be in better condition, surviving newsstand copies tending to be in poor condition). So let me re-ask my question another way… If I offered you the choice of two copies of a 1990’s-era comic book you were looking to collect: in my left hand I held a NM copy from the direct edition print run (purchased from a comic shop), while in my right hand I held a NM copy of the same issue but from the newsstand print run, which copy would be more desirable to you, now that you know the difference in rarity at just ~15% of copies being newsstand, and also knowing the typical condition disparity? But to blow our minds even further, as we move down that chart, we see that by the year 2000 the estimated Marvel newsstand percentage is down to just ~5% — think for example of Amazing Spider-Man #36 (all black cover, 9/11 issue), where newsstand copies would therefore have on the order of 1-in-20 rarity if these estimates are on target [by the way: a Marvel VP has described a 1999-era decision to walk away from the newsstand channel]. Move to 2003 and the estimated Marvel newsstand percentage is down to a mere 4.25%. Move to 2013 and the newsstand percentage is down to single digits industry-wide and by one estimate for Marvel, just one percent — think for example of Amazing Spider-Man #700, the final issue, where newsstand copies would therefore have 1-in-100 rarity. After 2013 by the way, Marvel decided to just shut down newsstand sales altogether. When newsstand sales through the last remaining bookstore outlets carrying Marvel’s newsstand comics ended in 2013, Marvel’s David Gabriel revealed that Marvel had actually ended newsstand sales to all of its other newsstand outlets years earlier — which we can conclude would most certainly have put their newsstand sales percentage below the rest of the industry in the later years of their newsstand distribution. Can you see now why understanding the newsstand versus direct edition difference is must-know information? In my opinion this is not just food for thought, but information that should shape the way collectors approach modern comic books. But equally interesting about Image, is that the challenging and competitive nature of newsstand distribution led Image to elect manufacturing choices for their newsstand print runs that in some cases were different from their direct edition print runs in order to save money. Some common choices: excluding centerfold posters, choosing cheap newsprint interior paper, and in one case I’m aware of — Spawn Batman — using card stock for the cover of the direct edition print run, but regular paper for the cover of the newsstand print run. These manufacturing differences may sound at first like just an interesting bit of trivia, but they have an important implication when it comes to studying data comparing direct edition and newsstand relative rarity: CGC treats these comics with manufacturing differences as variants for census and labeling purposes. Look up any “typical” comic book and CGC will make no distinction in the labeling or on the census to track newsstand copies versus direct edition copies… so the data — the official count of surviving newsstand copies that have been graded, versus direct edition copies — is lost for the vast majority of comic books. CGC census data as of this writing, where Newsstand Editions exist on census as a variant, show that 98% of all graded copies across these seven examples are from the Direct Edition print run, with 2% from the Newsstand Edition print run. To explain the table above, in the first column is the title and number of the comic — starting around issue #8, Spawn comics were manufactured with newsprint interior pages, and for issues #8, #9, and #12, Newsstand Edition variants appear on the CGC census; WildC.A.T.S. #1 has newsprint interior; WildC.A.T.S. #2 had a prism cover for the direct edition but a regular paper cover for the newsstand edition; Savage Dragon #1 in the table is the Limited Series, with newsprint interior paper for the newsstand edition; and Spawn Batman had a thick card stock cover in the direct edition but a regular paper cover for the newsstand edition. The second column in the table lists the CGC census numbers as of this writing for the regular edition, the third column lists the CGC census numbers for the variant “Newsstand Edition” copies, and the final column totals the two to get the total graded copy count for that issue. A grand total is presented at the bottom. Knowing all of this information, if you were to want to collect the first appearance of Angela (Spawn #9) or the first full appearance of Spawn (Spawn #1), or the first full appearance of the Savage Dragon (Savage Dragon #1 Limited Series [See Graphic Fantasy #1 for the first appearance of the “original” Savage Dragon from 1982]), or the first full appearance of the WildC.A.T.S., your preference without hesitation should be a newsstand edition copy over a direct edition copy. And when thinking about the relative numbers, knowing the total sales we can then extrapolate the count of just the newsstand edition variant copies. For Spawn #1 or Spawn Batman, both widely believed to have come close to the 1 million copy mark, a ratio of 99% direct edition to 1% newsstand would imply on the order of 10,000 Newsstand Edition copies of each. For Spawn #9 at sales of approximately 700,000, the ratio would imply on the order of 7,000 Newsstand Edition copies. 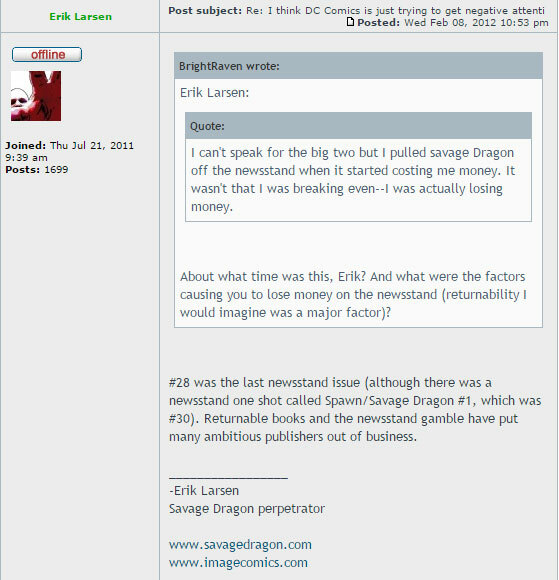 For Savage Dragon Limited Series #1, Erik Larsen was quoted as saying the first issues sold “hundreds of thousands of copies” — let’s up that to a full half million for sake of argument — which extrapolates to on the order of 5,000 newsstand edition copies. Erik Larsen wrote, “Returnable books and the newsstand gamble have put many ambitious publishers out of business.” Larsen pulled Savage Dragon off the newsstands because it was losing money, with issue #30 the final attempt to sell copies on newsstands (the newsstand version of #30 was Spawn/The Savage Dragon #1). With the newsstand channel, the level of returns determined the difference between making money or losing money. For Savage Dragon comics, with this distribution channel losing money, by 1996 Larsen made the decision to stop distributing Savage Dragon comics on newsstands altogether. The final attempt made at newsstand sales was issue #30, the newsstand edition of which was tweaked to try and attract more customers, labeled as “Spawn/The Savage Dragon #1” (instead of “Savage Dragon #30“) and having an “as seen on TV” logo on the cover as well to try and attract eyeballs. So we’re in the neighborhood of 34,000 around these issues. Suppose having Spawn on the cover provided a 15% sales boost for issue #30… that would put us at about 39,000. Let’s round up to an even 40,000 for total assumed sales for Savage Dragon #30. A ratio of 99% direct edition to 1% newsstand would imply on the order of just 400 Newsstand Edition copies of issue #30 (i.e. 400 copies of Spawn/The Savage Dragon #1). Even if we were to generously estimate total sales of Savage Dragon #30 all the way up at 50,000, the 1% newsstand ratio would still imply just 500 copies of Spawn/The Savage Dragon #1! Any time you can find an interesting comic book, that has on the order of merely several hundreds of copies sold, that’s one to consider collecting, and the reason newsstand editions are a recurring theme in this blog (here’s yet another example where the newsstand rarity math lands in the hundreds: Venom/Deadpool: What If #1 copies with $3.99 cover price), and in my Spawn and Savage Dragon blogs. And for many of these comic book examples, it takes an understanding of the difference between Direct Edition and Newsstand Edition copies, before you can truly appreciate just how collectible some of these rarities are. Great article your info is right in line with my research will continue to hunt down all newsstand issues. Just like marvels .30-.35 cent variants it only took Overstreet 25 years to figure out there was a difference!! A comparison against the .30 / .35 variants is right on the mark! With perfect 20/20 hindsight, we can look back now and ponder those, and there is quite a clear parallel: (1) We collectors could tell the rare ones apart, even though the “authority” of the time was overlooking them; (2) The distribution rarity (to anyone who knew the facts) was crystal clear. For any of the modern newsstand comics published after the point where Direct Edition copies have a UPC code, I would point out that their newsstand counterparts have a *different* UPC code. So, hypothetically if you had snuck a newsstand copy into a comic shop and brought it to the counter to be rung up, that code wouldn’t even scan, it wouldn’t have been in their system. Different product codes should be different census variants if you ask me! How does it make any sense to lump them together and keep the distinction hidden from the masses? Two distinct product codes and the rare ones can be told apart… just like with those price variants of the 1970’s here we have yet another overlooked situation where (1) collectors can tell the rare ones apart, and (2) the rarity is crystal clear to anyone who knows the facts. Someday in the future, maybe collectors will look back at these — just like we look back at those 30/35 cent variants now — and wish they were out there looking for those rare newsstand copies and buying them up while the market premium was absent! A phenomenon that might — just might — draw awareness to newsstand rarity in general, are the price variants of other decades after the 70’s and growing collector awareness about them due to CGC census distinction. Canadian newsstand editions were price variants during a window of time in the 1980’s and collector awareness is definitely increasing about those; and in the late 2000’s there are a few “keys” where the newsstand copies carry not just a different UPC code but also a $1.00 higher price tag. And for those, it seems the “authority” of today is willing to make a census distinction because of that cover price difference (there are now several issues on census in the 2000’s where “Newsstand Variant” appears separately with a tiny count of copies). You never know when one of these currently-overlooked price variants will suddenly get noticed by the masses based on a character development, an artist development, a movie announcement… and then realization may set in that even when there isn’t a census distinction the rare version should still be sought after. For example take the case of Spawn #1 and Spawn #9. For Spawn #1 the rare newsstand copies were simply lumped together by CGC with their direct edition counterparts on census (and still are). Before the first appearance of Angela was in the sights of collectors, Spawn #1 newsstand rarity was broadly overlooked, as judged by the absence of market premium for newsstand copies. Perhaps in part that was because if you looked up Spawn #1 on census, you saw just the one version and no variant version. Overstreet figured out there was a difference within a year or two of their existence… Star Wars #1 35 cent has been known to them since almost the beginning. They just didn’t know the extent of the difference until much later. So in 1997 — a full two decades after the 35 cent variants were published — the initial reaction of Bob Overstreet himself to McClure’s findings was one of disbelief… Talk about overlooking a “class” of comics! And from McClure’s quote describing the 1999 meeting, it sounds like he was practically laughed out of the room when he suggested the enormous future value potential of the 1970’s price variants. I think the experience described by McClure shows pretty clearly just how under-the-radar and undervalued the 1970’s cover price variants were for the initial decades following their publication. Even when he educated a room full of Overstreet Advisors — smart people with tremendous background knowledge about comics who should have realized McClure was right — instead of seeing their potential most of them mocked him… Can you imagine?! Instead of the rarity mathematics and what that meant for future investment potential “clicking” as it should have done, they were so stuck in the past (why would they be worth anything that substantial in the future if they hadn’t for twenty years? ), that they treated McClure in a way that made him feel mocked and derided. In retrospect, that’s crazy! The initial reaction of Bob Overstreet — and the reactions of the majority of advisors in that 1999 meeting — that’s what’s “insane” in retrospect. McClure wasn’t being crazy, he was being forward looking! But of course, despite any mockery he might have suffered initially, all it took for those variants to take off was a spark of collector awareness of their existence, coupled with the indisputable low distribution mathematics, and eventually the demand for the more-rare variants came to overtake the tiny supply by such a degree that 35 cent variant keys in high grade are worth a small fortune today! So I think collectors today need to ask themselves: wasn’t it forward looking for anyone to have targeted the rare 35 cent variants over their prevalent 30 cent counterparts in their early under-the-radar years? Today, isn’t it similarly forward looking to target the more-rare newsstand version of a late modern comic book we are looking to collect, especially if we can pay equivalent price (or close) versus collecting the prevalent direct edition, while awareness out there is still low enough that it is possible to do so? Isn’t it forward looking to target the 1980’s cover price variants produced for newsstands in Canada (and therefore having indisputable low distribution) — variants which are true first-print, US-published, Type 1A price variants under the definition put forward by McClure himself (a definition that was eventually published in the Overstreet guide)? Nice read.. I always wondered about those spider-man rectangles. Now I know what to look for. Great article. The death of the newsstand is the single greatest problem with comic sales. There is no easy entry point for new readers. The only real entry point is the movies and TV shows. That is the big reason Marvel keeps Shield on television. They are so desperate to have television presence that they keep even a low ratings show alive. DC has 6 shows and 2 or 3 in the pipeline. Marvel began selling to the direct market in 1973/1974, with Phil Seuling, whose idea it was. They began to mark the covers differently in late 1976, with Feb, 1977 cover dates. They simply went company-wide with the program in 1979. Here below are some recommended links for readers interested in pre-1979 “non-newsstand” comics. Created at the behest of Whitman/Western Publishing, non-newsstand-distributed comics were sold in Whitman multi-packs, comics which did share a common “feature” with the later Direct Edition comics that were sold to specialty comic shops: they were non-returnable. These may have helped serve as inspiration for the distinct Direct Editions that began across Marvel’s comics in 1979. There are several inaccuracies in the sources you cited, such as Rozanski saying “different printings of monthly comics were first created by Ed Shukin, the Vice President of Marketing at at Marvel Comics, in the summer of 1979” is WRONG. Again: “different printings” began in late 1976, with the Feb, 1977 cover dated books. Shooter says he “didn’t believe”, but that’s anecdotal, not proof. There’s no doubt that the lion’s share of these early fat diamond (AND skinny diamond!) books went to Whitman. But there’s also no reason to think that they ONLY went to Whitman…they were, in fact, Direct market. 4/20/2017 — As an update, readers should know that the growing grading company CBCS [Comic Book Certification Service] has now announced that on a go-forward basis, they will label all comics with “Newsstand Edition” and “Direct Edition” on their labels to distinguish these types, for all comics from 1977 to 2000 (not sure if they meant “onward” or if they’re really ending at 2000) — so by that date range they are dubbing those earliest non-returnable Whitman/Western multi-pack comics as “Direct Edition” too, from pre-1979 [read the comment above this one for more information on why those two different dates, 1977 vs. 1979, might have been chosen as they were making their decision — CBCS going with 1977 means they are distinguishing non-returnable comics including those Whitman/Western ones as “Direct Edition” vs. returnable comics as “Newsstand Edition”]. This forward-thinking decision on their part to “break out” newsstand comics as distinct variants is excellent news for newsstand collectors and for the hobby at large. It also means the rolling snowball of growing newsstand awareness just got a huge step-up in mass. That makes 2 out of the 3 big grading companies to broadly distinguish newsstand comics from direct edition comics (PGX has already been doing so for some time). I hope (and urge) CGC to eventually follow in this path too and distinguish newsstand comics broadly and not just in the current special situation categories! I had found a copy of Shadowhawk 1 as a UPC variant in a dollar bin. Who cares? CGC does not have one single copy in their census as of this date. Does this mean that they have been lumping all the submissions into one category? Anyway, I have submitted it and had noted “upc variant” but who knows what will appear on the graders label. Hopefully at some point collectors will become more aware of these odd-ball variants and start paying attention. Yes, it’s much more than “lacks silver foil” that separates this edition from the Direct Edition copies. No cardstock, no embossing, different price, different interior paper. Yes, it’s the same art. But it’s also a variant. It’s frustrating as a collector when you know you have something different but the grading companies (CGC in particular) pretty much ignore facts and do the lazy thing and either give you an inaccurate label or disregard the “notes” you provide. But yes, I will keep an eye on this thread and get back to you. Thanks for the reply. Is there somewhere on the net a list of which comics were made with newstand variant? Because I have in my hands several collection of marc spector moon knight all with barcodes except for #7. Does 8 to 24 exist without barcode? After a couple months at CGC, my copy came back a 9.6 but with a caveat. A green label. I cannot believe this. It says it is missing the Image 0 coupon. Well, of course it is – no UPC versions shipped with an Image 0 coupon insert. I have double and triple checked this fact with other collectors. So I guess I need to ship the slab back for a recase and a new label. I believe it is impossible to educate CGC about most anything related to variant editions. Even when you put the word variant on the invoice worksheet that accompanies the order, they seem to just do what they want. Phone calls seem to go nowhere as well. I’ve had a handful of books labeled incorrectly over the years and it is very frustrating. But anyway to the original point, they did not put anything on the label as this issue being a variant. Only that newsstand versions exist without silver foil.